Mobile. Social. Responsive. Synchronized. As a next-generation eCommerce business, you must ensure that these most crucial aspects of customer relationship management are the key deliverables in your CRM solution. Customers not only want to feel like they’re getting a quality product at a fair price, they want to know that you care whether they feel that way. Today’s buyer uses social media as a tool to decide where and what to purchase and expects an omnichannel experience that allows them to transition from virtual to brick and mortar – and back again, without your organization skipping a beat. If you’re a manufacturer or wholesaler, your customers require your sales team to be on-target, current and mobile. 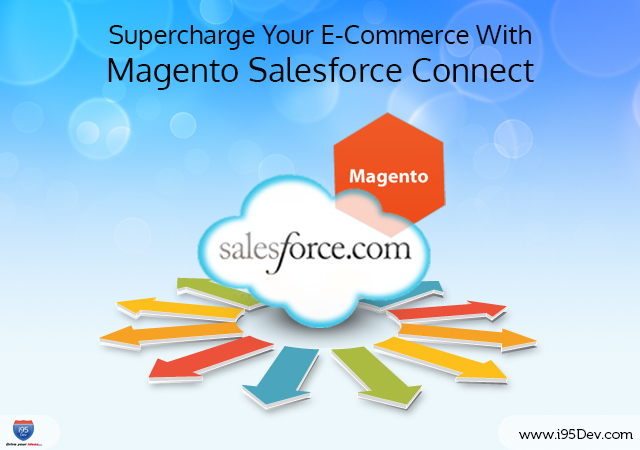 i95Dev’s Magento-Salesforce Connect seamlessly integrates SalesforceCRM with your Magento ecommerce platform, enabling you to master social media, respond nimbly to the needs and concerns of customers and place your entire operation on the same page for effective customer engagement and sales conversions. Long recognized as the No. 1 solution around, SalesforceCRM provides businesses an effective means of tracking customer data, moderating and monetizing social media interaction and aiding sales activities. E-Commerce retailers have long worried over why so many customers abandon their shopping carts before completing a transaction. Joined with Magento, SalesforceCRM will automatically convert those customers’ information and intended purchases into leads, pulling it from your ecommerce portal into SalesforceCRM. This empowers the sales staff to follow up on the pertinent lead and helps in increasing productivity. Wholesalers and manufacturers will benefit not only from this aspect, but from the benefit to their sales team. The Opportunity Management feature allows sales and marketing managers to see just exactly from where leads are entering the pipeline – crucial information for sales team optimization. SalesforceCRM organizes and categorizes opportunities, allows for instant chats and e-mail between on-the-go sales associates and others back at the office and can render it all on a mobile device. eMarketers have long wanted an all-in-one tool for organizing social media marketing campaigns that capitalize on real-time information allowing effective segmentation and targeting. They’ve found it in SalesforceCRM, which works with Facebook, Twitter and other social media to help your marketing team find new customers. Also, plug it in to all your channels with Magento-Salesforce Connect and easily monitor what’s being said about your business and products. Ecommerce platform cannot independently optimize sales. Integrating SalesforceCRM with your Magento ecommerce software provides real-time data which helps in improving customer responsiveness and operational management. The combination of SalesforceCRM with your ecommerce platform helps to convert abandoned shopping carts, stay in contact with leads and synchronize updates for objects such as accounts, opportunities etc. Fewer delays and mistakes in service means your customers’ confidence grows. Integration gives a 360-degree customer view, which helps to enhance sales and improve strategies. Magento ecommerce platforms provide the scalability, flexibility and features for business growth whereas SalesforceCRM allows sales managers to monitor and analyze their team’s activities so that they can forecast sales and plan ahead. Integrating the two with i95Dev’s Magento-Salesforce Connect can only improve business. To learn more, please feel free to contact us at http://www.i95dev.com/contact/or give us a call at 301.760.7499.